As my G5 has 36mm carbs fitted, with matching manifolds, fitted by a previous owner, I am thinking of returning it to 30mm carbs as, with std. Spada/G5 heads and valves, I cannot see how the big carbs can do much good. I realise the original square slide 30mm carbs are "hen's teeth" these days and likewise the original cast ally manifolds. So it'll be round top, round slide 30mm carbs, and I see that suitable plastic manifolds are available from Gutsibits. Howevere they warn that they are not the same angle as the original parts and that "clearance may need to be made for air filters". Does anyone have experiance of using these plastic manifolds ? What air filters fit best ? How does the carb top/cable entry position work out in relation to Spada/G5 petrol tank & taps ? Looking at the plastic manifolds on Gutsibits site, they now look to me to be a very similar angle to the Lemon manifolds I have, so filter position and carb top will be similar to what I have at present, though mayby the 30mm carb has smaller overall dimensions and there will be a little more space all around. Comments from those who have the PHF30mm carbs, retro fitted are still welcome. I bought some of the 'plastic' manifolds from Gutsibits myself to do the VHB30-to-PHF30 conversion - which I never got around to doing. 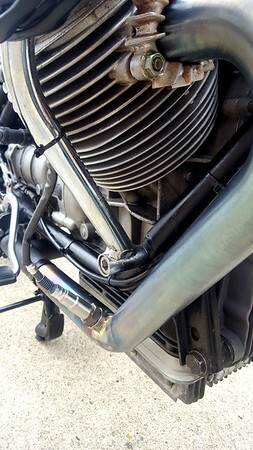 The angle between the original VHB and PHF manifolds is considerably different, a quick comparison just now on my own G5 would suggest around a 25 degree difference, the VHB types being angled inwards (towards the centre of the bike) considerably more than the PHF type. However, if you've got the 36mm carbs and manifolds already fitted, you're already there as the angle will be the same as the 'plastic' manifolds, and any modification/replacement of the sidepanels will already have been done. Replacement 30mm PHF's should fit straight onto your existing manifolds too if I'm not mistaken - a pity as I'd like to have bought your alloy ones from you!! (I've gone the whole hog and am replacing the pistons/heads/carbs on my own G5 for Le Mans types). It sounds as if I was right, and the plastic manifolds are the same shape as the lemon ones, and that the 30mm carbs do not provide any significantly greater space for the air filters. I already have cutaway side panels and its still a struggle to find room for the quite small K&N type filters. So Gutsibits plastic manifolds will not be any advantage to me. I would really prefer to have a pair of original ally elbows as fitted to round barrel Spadas & T3s etc, as, having grown up with Phil Irving's "Tuning for speed" I do not like the idea of mis matched carb/manifold/inlet tract internal diameters. Obviously with a G5 I'm not exactly "Tuning for speed", but what works for speed in these stakes, usually works for smooth running and good economy as well. So that's a reason why I want to replace the big 36mm carbs. I know that the G5 inlet tract is approx 33mm rather than 30mm, but its still a step and the 36mm carb is bigger than the motor needs. I know that Dellortos from (I think) a 750 Ducati might be 32mm which would be dandy, but they were hard to find when we talked about them in the '80s. I have thought about making a pair of manifolds. If I could find stainless steel "elbows" with the right ID I could probably do it. But then I thought "What else might be available ?" And remembering "Allen's Carburettors" as suppliers of Mikuni carbs to suit all sorts of bikes, ancient & modern, I had a look. On their website at www.allensperformanceparts.co.uk I found "New Moto Guzzi VM32 kit" and there they were, pictures of a G5 ! with 32mm Mikunis munted on newly manufactured ally manifolds, but sadly/worringly no price mentioned! 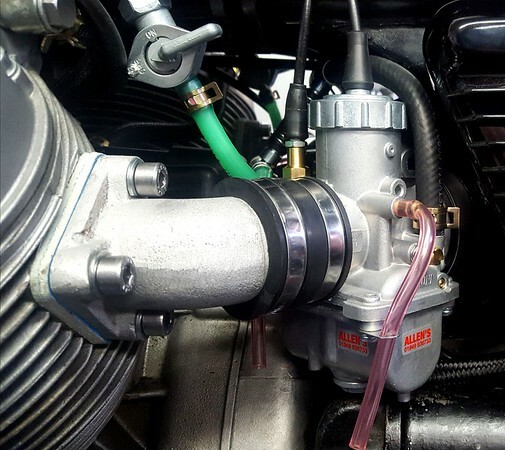 However, new Mikuni carbs are notably more affordable than new Delorttos, so I have emailed them for details. I've got to admit that Mikunis will look a bit odd hanging out on each side of an old G5, but if they fit and work well, it could be the way to go. Over £600 for the complete kit ! Carbs are cheap enough, but obviously getting the manifolds cast has been an expensive job. Back to the drawingboad for me. Or, has anybody got a pair of T3/Spada ally manifolds they can spare ? When I asked "Who's done it" it was to gather info, not necessarirly be told exactly how. But, the concentric conical filters, I had forgotten them, (35 years ago) What I have is those oval things, and too small diameter to the carb, and they keep slipping off no mater how I fit the hose clip, and they were sold as the right ones ! I'll look up the conical ones. Does anybody know the K&N part number? ... What I have is those oval things, and too small diameter to the carb, and they keep slipping off no matter how I fit the hose clip, and they were sold as the right ones ! If it's the same oval things I know, most likely cos of being put onto 36mm carbs, they are intended for 30mm carbs, or at least they do fit onto VHB30 carbs because I've done that (twice) and they never fell off. However they need the stock inlet stubs to fit properly. You could try 'Nick's Euro Bits' for a pair of alloy manifolds - he has a good deal of second hand spares. He's at a lot of autojumbles and on ebay. I bought the full kit from Allen's and it went together very easily - granted, I had to make different cables but that's because mine was a non standard set up. Right from the first start up the tickover was far, far better. On the road running jetting wasn't great so I went to town on this by getting a wide band sensor kit and setting it all up. As I'd just bought a rather nice new exhaust system I didn't want drill holes in it for the lambda bosses, so I bent up some new down pipes for the purpose of setting the carbs up and brazed the bosses into these. Working with Dave and Steve at Allen's, it didn't take too long to get the old G5 running really nicely and I'm very happy with the results 🙂 I believe the jetting I've now settled on is what is now supplied with the kit but of course mild tinkering will probably still be necessary. The temporary downpipes and lambda sensor.